When I was ten, I had a manual camera that I taught myself to use. If you had told me then that someday I would have a camera that took excellent pictures without film, shot video, and was small enough to fit in my pocket, I would have thought it magic. Now, of course, everyone has magic iPhones, another facet of modern life we take for granted. I love my iPhone not only because it can go everywhere with me, but because it's my meditation partner. To take a good photo, my attention is fully in the moment. When framing a photograph, I only notice the here and now, which is what the shutter snaps - never the memories of the past or the fantasies of the future. And the motivation behind every photograph is the same: this is a good moment. This present moment is enough. "Fish," he said with delight. "Fish!" I said, also delighted. "Fish!" said another man, sitting nearby. "Heera," he proclaimed with pride. "Good name," I told him, even though I believe "Heera" means "Cumin." Maybe it was also some South Indian queen. Every relationship begins with a look, at least in the real world off-line. I became friends with this boy on the train because he was the one looking at me, and in his laughing eyes, I could see that he also appreciated the absurdity of riding a train standing up, crowded in the foyer with 17 other people. After that train ride, and a night in Trivandrum, and a rickshaw ride to the airport, and a cross-country flight, and then another rickshaw ride, I entered the capital of Rajastan, the Land of Kings. 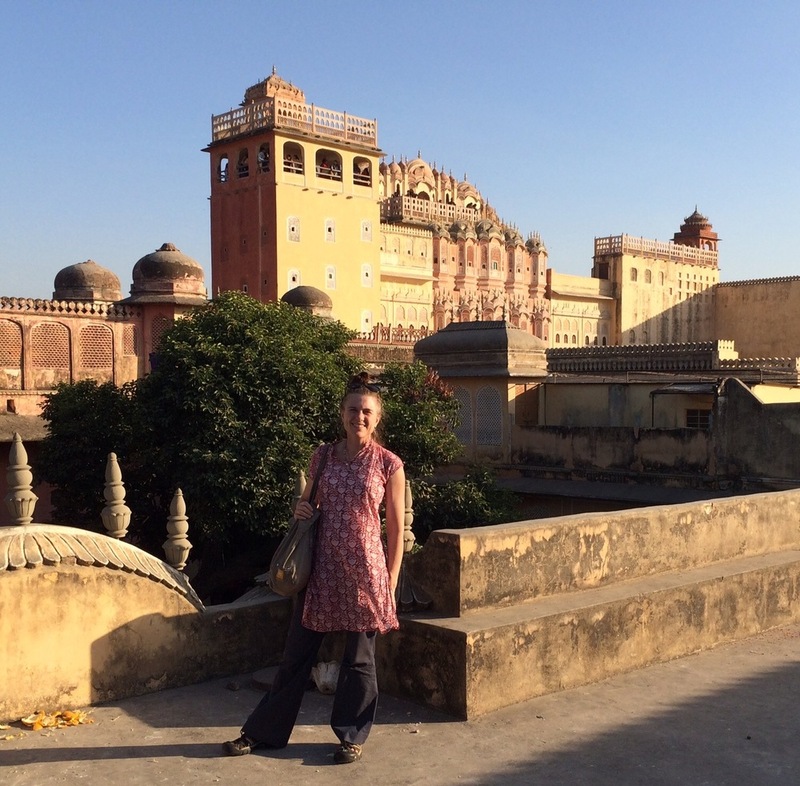 I only had one day in Jaipur, the Pink City, so I picked one place to really see and enjoy. I went to the Hama Majal- The Palace of the Winds-billed by my guidebook as "Jaipur's most distinctive landmark". The more I read about it, my choice seemed even more relevant. Maharaja Sawaj Pratap Singh had it built in 1799 as a place where the royal ladies could look out and see the city from a place of safety. The Hama Majal turned out to be a refuge for my royal self also. Within ten seconds of descending from the rickshaw at the entrance, I was accosted by a local merchant who didn't want to sell me anything, just show me a nice view of the place. "Free of charge," he said more than once, so I went. As we took in the nice view, he told me about his studies of yoga and Ayurveda medicine. Then he asked me if I wanted to see his shop. "Five minutes," he said. Carried along by the current of his personality, I went with him into a back room filled with jewelry, tapestries, and Rajastani puppets. He had offered chai, and now also offered "rum, vodka, whiskey?" He added that he'd smoked all his marijuana, but he could get me some by evening. I stuck with the chai. Of course my new friend did want to sell me something, opening dozens of boxes of jewelry for me to peruse while he got the tea. When he returned, we drank the tea and he offered me a free massage so he could practice his skills. I hemmed and hawed, not having a quick excuse at the ready. "Don't you like massage?" he said. Inside the Hama Majal, I immediately thought of my photographer friends, how I wished they were there to dig into the visual feast with me. The smooth curves of scalloped doorways, the tiny peek-a-boo shuttered windows, the honeycombed windows of flower design--all served as wonderful details for my meditation. And this, too, is a good moment. My favorite moment was at the top, looking out over the Pink City. I expected to see the pink stone glowing in the setting sun, but I was surprised by the hundreds of kites lifting up into the sunset winds. Too small to be captured on my screen, the kites danced in the air like bits of confetti, celebrating the victory of our living through another day. I realize that I'm posting this blog on the first day of a new year, a time of hope and promise when some of us resolve to be better, and some simply try to recover from holiday celebrations. However, the masters tell us that there are no years, but only moments. Our duty, then, is to frame each one so that we can fully absorb its beauty.